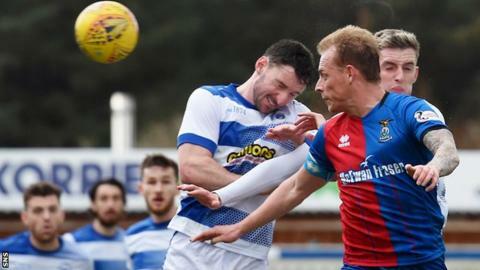 Carl Tremarco's early goal saw Inverness Caley Thistle secure just their third home Championship win of the season to cement fourth place. The Caley captain headed home Liam Polworth's 11th-minute corner at the near post for what proved the winner. Brad McKay should have doubled the lead when he headed over from three yards and Gregor Buchanan cleared Tremarco's second-half header off the line. Charlie Telfer and Chris Millar came closest for a blunt Morton side. Polworth, Coll Donaldson, Aaron Doran and Jordan White could have added further goals for Thistle, who are five points clear of Dunfermline in the final play-off spot. Inverness CT boss John Robertson: "We created plenty of chances today but we had to hang on. The last five or six minutes we decided to just take what we had. I cannot praise the players highly enough for their attitude and application. "They gave it everything and they gave absolutely everything they had on Tuesday [in a Scottish Cup win over Ross County on penalties] and absolutely everything today so it's a wonderful three points. It was a massive performance from them." Morton manager Jonatan Johansson: "I'm disappointed with the result obviously and I'm also disappointed in the way we lost the goal - another set-play. I know we are a small team but we need to be better at defensive set plays - they've been costing us for a while now. "Before that I felt everything was going alright. I think we played some nice passing football but in the final third we didn't have the spark or belief and it was powder-puff at times. We never really threatened them."